There’s a lot more to discuss with Secretary-General Kofi Annan than just a permanent seat in the Security Council. WHEN THE United Nations Secretary-General, Kofi Annan, meets Indian leaders this week to discuss the ambitious agenda for reform of the world body outlined by him in a landmark report last month, he will find his hosts almost singularly pre-occupied with one issue: the expansion of the U.N. Security Council. Though this is unfortunate, it is not surprising. Mr. Annan’s report, “In Larger Freedom,” contains many other suggestions – both good and bad – which can affect India’s interests in a number of ways. There may be unease in New Delhi at the expanding prerogatives of the Security Council on issues such as the use of force, proliferation, and intervention, for instance, but successive governments have tended to take the view that these concerns can be dealt with once India makes it to the high table that is permanent membership. So far, Mr. Annan has remained agnostic about the two proposals outlined in his report (see box), though the Indian Government would ideally like him to throw his weight behind Model A. This, of course, is unlikely to happen because there is a genuine and even bitter divide between countries on this question. Italy, Pakistan, Mexico, South Korea and others claim to have brought together more than 40 countries under their `Uniting for Consensus’ banner in opposition to Model A. Some of these countries oppose particular candidates for permanent membership; others feel they would have a better chance at representation under Model B. While the two proposals for expanding the membership of the Security Council have generated the most excitement – and heartburn – around the world, including India, there has regrettably been virtually no debate on a whole raft of equally controversial proposals being made by Mr. Annan. On the use of force, Mr. Annan’s report correctly notes that the U.N. Charter is flexible enough to allow states to defend themselves under a wide variety of circumstances. Article 51 gives countries the right to defend themselves against an imminent threat, and latent but not imminent threats can still be responded to with force provided the Security Council approves it. In suggesting that any decision to authorise the use of force be based on four criteria – (i) the seriousness of threat, (ii) purpose of action, (iii) principle of proportionality, and (iv) chances of success – the report is attempting to ensure the Security Council does not act out of purely political considerations. However, its recommendation that the Security Council adopt a resolution setting out these principles is unlikely to be accepted by the U.S. If there is one conceptual flaw in the report, it is the failure to recognise that the credibility problem of the Security Council stems not just form its “ineffectiveness” or unrepresentative character but from its lack of accountability. At a time when the Security Council’s prerogatives seem to be expanding at a fast pace, there also needs to be some effective institutional mechanism for reviewing – if not restraining – the exercise of power by the Council. For example, the Algerian jurist and former President of the International Court of Justice, Mohammed Bedjaoui, has suggested that member-states should have the right to seek a judicial review by the ICJ of an Security Council resolution which affects them. And the former U.N. Secretary-General, Boutros Boutros-Ghali, had advocated greater reliance by the General Assembly on Article 96 of the U.N. Charter in order to refer to the ICJ “questions concerning the consistency of resolutions adopted by U.N. bodies with the Charter of the United Nations“. On two other issues, too, Mr. Annan’s report needs to be widely debated in India before its proposals are adopted. The discussion on the problem of proliferation of weapons of mass destruction is lop-sided, focussing exclusively on the tightening of dual-use technologies rather than seeking new mechanisms to restrain the development of new types of nuclear weapons and missiles (including missile defence systems) by the U.S. and other big powers. Mr. Annan calls on all states to adopt the model Additional Protocol of the International Atomic Energy Agency (thereby accepting full-scope safeguards) and accept restraints on the development of uranium enrichment and plutonium separation technologies. These might well be necessary, but non-nuclear NPT members should not give up their right to develop civilian technologies without the nuclear weapons states giving up something in exchange. Similarly, the report’s endorsement of the U.S.-led Proliferation Security Initiative – in which the U.S. and its allies give themselves the right to interdict ships on the high seas suspected of carrying illicit nuclear, biological or chemical cargoes – is a little surprising. One would have thought the U.N. Secretary General would advocate the use of a U.N. or multilateral forum for the negotiation of any new instrumentality. Simply stating that the Conference on Disarmament “faces a crisis of relevance” because of “dysfunctional decision-making procedures” is not good enough. 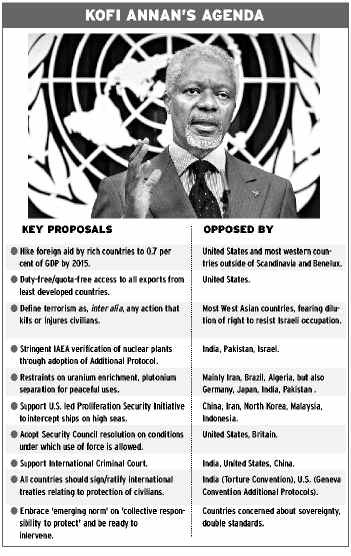 Mr. Annan should have come up with proposals to increase the CD’s effectiveness. However, his attempt to set aside the objection that “state terrorism” be excluded from this purview because states are regulated by other laws such as the Geneva Convention is problematic. As Palestinians, Iraqis and others have found out, accountability for the wrongful use of force by states (by Israel or the U.S. and others) is very poorly regulated and enforced. This entry was posted on April 26, 2005 by Siddharth Varadarajan in Indian Foreign Policy, United Nations.